Grasp Confusing Kanji Terms Such as "Radical" and "Component"
What Is a Kanji Radical? The distinct parts of a character are known as components. For instance, 魚 (98: fish) has three: ク (to crouch), 田 (field), and 灬 (fire). One might view 灬 as consisting of four parts, but those small lines collectively make one meaningful component that represents fire. People often refer to any component in a character as a "radical," but this confuses the issue. Only one component at a time functions as the radical, so let's reserve the word "radical" for the component that's serving as such. When people make kanji dictionaries, they organize them by radical. That's the reason radicals exist at all. To understand this better, imagine an enormous, messy storeroom in a house. The only hope of creating order would be to devise categories: sports equipment over here, suitcases over there, paint cans in the corner, and so forth. In the vast "storeroom" of Chinese characters, radicals are like these category names. That is, a kanji dictionary has many sections. One contains characters with the "earth" radical, 土, such as 地 (167: earth) and 基 (641: foundation). Another section includes characters with the "grass" radical, 艹, such as 芝 (1335: lawn grass) and 芸 (470: art). I choose to interpret this sculpture in Vancouver, Canada, as paying homage to the radical 冂, known as the "upside-down box" radical. And a well-deserved tribute it would be! Without 冂, we couldn't have 円 (4: circle, yen), the symbol for yen. And thanks to 冂, we can count books with 冊 (874: counter for books). Finally, 冂 gives shape to 内 (364: inside). Bravo to 冂 and to the person who created this radical piece of art! If you look at 売 (192: to sell), you might think, "Hey, 儿 is a radical, so 売 must be in the 儿 section" of the dictionary. Not so fast. Many components can serve as radicals, but they don't always function as such. They can be "on duty" or "off duty." (These are terms I coined.) In any character, only one radical is “on duty." In 売, all three components (士, 冖, and 儿) have the capacity to be radicals, but 士 is the actual radical, and the other two are just components. By contrast, 冖 is the radical in 写 (297: to be photographed), whereas 儿 is the radical in 元 (106: origin). Let's consider one more example like this. 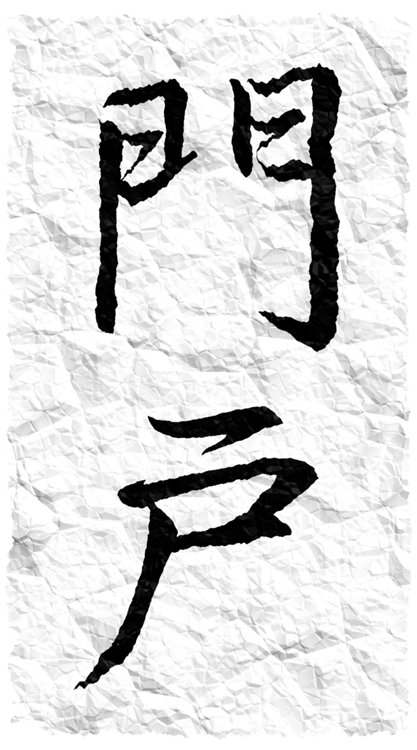 The character 涯 (1069: horizon) contains 氵, 厂, and 土. All can serve as radicals. That is, you'll find these three shapes in a dictionary chart of radicals. But in 涯, the active radical is 氵, while the other two components are just along for the ride. They can add meaning or sound, but they contribute nothing to the classification scheme. If a kanji consists of just one component, such as 女 (35: female), the whole kanji functions as the radical. 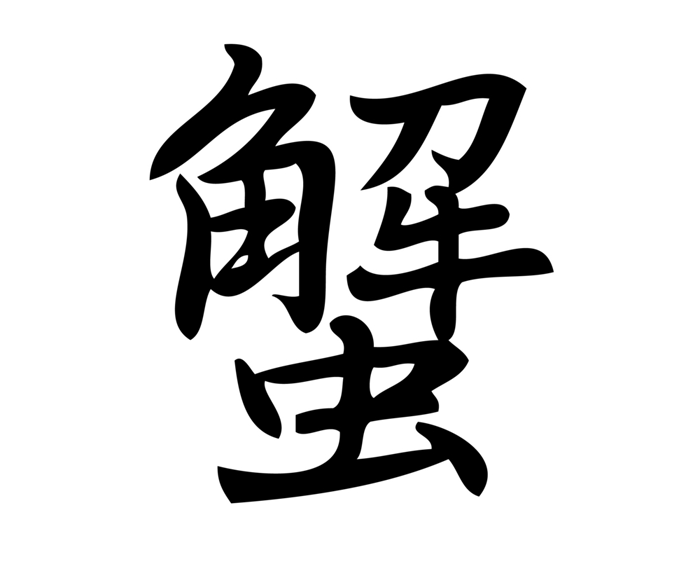 In this word, 玄人 (くろうと: expert), both characters double as radicals! That is, in each case, the entire kanji serves as the radical. To learn more about this word, see essay 1227 on 玄. • Start big and work down: A radical isn't always as small as a component. (By the way, when I say "big" or "small," I'm talking about the number of strokes.) The entire character could constitute a radical. Let's return to 魚. Even though it contains three components, 魚 serves in its entirety as a radical. When that's not the case, a significant chunk of the kanji or a conglomeration of components could still be the radical. 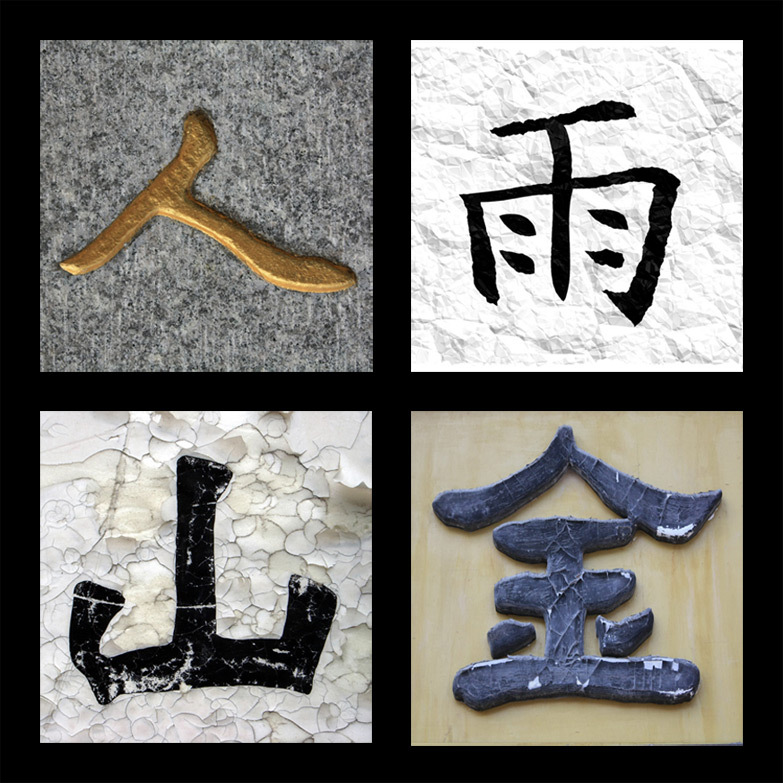 These are all radicals: 酉, 頁, 金, 飠, and 馬. Look for the most elaborate clusters of strokes first. You might spot "legs" (儿) in a kanji and think you've found something important when in fact there may be a whole devil (鬼) lurking in that character! • Left and right: If the kanji divides neatly into a left and right side, look for the radical on the left first. If the left side isn't the radical, then the right side must be. Positions 1–2: When a kanji divides neatly into left and right sides, the left is へん (偏: side), and the right is つくり (旁: side). Out of the seven positions, Position 1 is the most common place to find a radical. Positions 3–4: For characters that divide neatly into a top and bottom, the top is かんむり (冠: crown) or かしら (頭: head), and the bottom is あし (脚: foot) or した (下: below). Positions 5–7: Enclosing elements are usually かまえ (構え: structure), but there are two exceptions; たれ (垂れ: to sag) enclosures go down the lower left and across the top (e.g., 广), whereas にょう (遶: to surround) enclosures go down the lower left and across the bottom (e.g., 辶). "Fish to the Left" for an explanation. The "small shell" radical, 貝, is pronounced かい. In 販 (1715: marketing; to sell), this radical is called かいへん. When following ん, the へん changes to べん. That's the case with にんべん (亻, the left-side "person" radical) and ごんべん (言, the left-side "word" radical), for instance. The "seal" radical, 卩, is pronounced ふし. In 印 (425: mark, seal), this radical is called ふしづくり. Note that voicing has changed つくり to づくり. The "mountain" radical, 山, is pronounced やま. In 岩 (249: boulder, cliff), this radical is called やまかんむり. In rare cases, the かしら tells us not that the radical is at the top of a kanji but rather that the upper part of some kanji is the radical in question. For example, 糸頭 means "head (upper part) of 糸," which is to say 幺 (radical 52: the "short thread" radical). The "legs" radical, 儿, is pronounced ひとあし (literally, "human legs"). Another name is にんにょう. Although the -にょう suffix makes it seem as if にんにょう is the name of a Position 7 radical, that appears to be a misnomer. In 児 (697: child), this radical is 儿 and is still called ひとあし (or にんにょう). If あし is already part of the name, there's no need to add it here. The "gate" radical, 門, is pronounced もん or かど. In 閉 (968: closed), this radical is called もんがまえ or かどがまえ. The "sickness" radical, 疒, is pronounced やまいだれ. It seems like 疒 by itself should be called やまい, but this radical can go in only one position, so it comes with a two-part name preassembled. In 疲 (1728: exhaustion), this radical is called やまいだれ. The "devil" radical, 鬼, is pronounced おに. In 魅 (1839: to bewitch), this radical is called きにょう. Whereas おに is the kun-yomi of 鬼, the on-yomi of キ kicks in here. For the most part, when Joy o' Kanji states what the radical of any given character is, that information has come from the Kangxi Dictionary of China. I mention this because not all dictionaries agree about that issue—or even about how many radicals exist. There's a historical basis to these disagreements. In 1716, the Chinese grouped about forty-two thousand kanji into 214 radical categories, and Japan followed suit. Then in 1946, the Japanese simplified several aspects of their language, including the classification and shapes of many radicals. Many dictionaries retain the 214-radical system as an organizing principle, but Spahn and Hadamitzky have structured their dictionary around 79 radicals. When it comes to radicals, dictionaries for native speakers vary, too; one has 245 radicals, whereas another has 257. Some of the numerical differences come down to cases such as 阝. Nelson says that 阝 on the left side of a kanji (e.g., 限, 665: to limit) is a different radical from the same shape on the right side (e.g., 郎, 1936: male name suffix; counter for sons). Etymologically, they are indeed different;阝 has evolved from 阜 and 邑, which appeared on the left and right sides of characters, respectively. Both meant "village," but 阜 primarily meant "hill." At any rate, Nelson differentiates the two types of 阝 with nomenclature and numbering systems, whereas Spahn and others treat 阝 as one radical, no matter where it's located in the character. There's also the question of 月. As a radical, 月 rarely means "moon, month," though it does in a few cases, including the full-sized character 月 (16: moon, month) and 望 (585: hope; to look afar). For more on that, see Radical Note 74, "The 'Moon' Radical." Much more frequently, the radical 月 is actually a simplified form of 肉 (365: meat, flesh), which originally served as the radical in those characters. As you'll see in Radical Note 130, "The 'Flesh' Radical," that radical tends to have something to do with body parts or bodily functions, as in 肩 (1212: shoulder). Speaking of 肩, dictionaries disagree as to whether the radical is 戸 (とだれ, the "door" radical) or 月 (meaning, 肉). There's no harmony in the world of radicals! 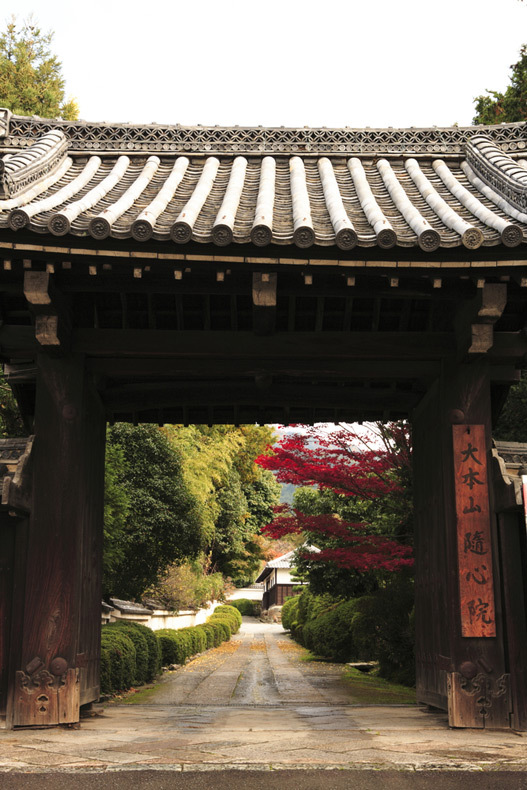 Speaking of 戸, it appears in a word made of radicals: 門戸 (もんこ: door). As a consequence of simplification, many kanji have acquired "variant" forms. For instance, 人 (39: person) has the variants 亻and . All mean "person," and all can be radicals, but they obviously look very different. When there are no parentheses, we're seeing the radical in its primary, unchanged form. Meanwhile, the letters in parentheses denote variants. I would have expected the pure form of the radical to be the one that stretches out fully. Wrong! The variant is the wide one! This feels counterintuitive; we know 足 (51: foot, leg) as a character in its own right, and surely that should be more important than the squished form. But the skinny version appears in other characters much more often than the full version does. As we're limiting ourselves to the Joyo set, which excludes old forms, we won't need to worry about this aspect. However, old forms do present themselves in the wonderful online dictionary Denshi Jisho. For example, if you consider 芝, most dictionaries would tell you that the radical is 艹. However, Denshi Jisho says the radical is 艸, which is the ancestral form of 艹. I think it's extremely confusing to say that 艸 is the radical of 芝, because we can't see 艸 anywhere in the character. For that reason, I've opted to use current forms of radicals throughout Joy o' Kanji. You may be wondering why it even matters what the radical of a particular character is. Why do you need to know? My feeling is that you don't need to know! But if you do know, there are great benefits. Historically, it was essential to know the radical, because that was the only way to find the character in many dictionaries. That can still be true; although most dictionaries have yomi indexes, you have to work with the shape if you don't know the yomi. Nowadays, though, wonderful electronic dictionaries such as Denshi Jisho enable you to locate a character simply by identifying its components—maybe just one of them. Halpern also devised a system that makes it possible to find a character based on its stroke count and structure. With such tools, the radical has lost much of its earlier importance. All four characters are radicals, and what iconic, powerful characters they are! From left to right, the top two are "person" and "rain." Across the bottom, we have "mountain" and "gold." It's hard to imagine the kanji world without these omnipresent shapes. Many people still like to know the radical because it can lend its meaning to the whole character. For instance, 炉 (1934) means "furnace, hearth." The "fire" radical, 火, clearly makes a large semantic contribution here. Those who are most familiar with kanji (particularly native speakers) will approach an unknown character by identifying its radical and its phonetic (a component that lends sound and sometimes meaning to the kanji) and then making an educated guess about the yomi and meaning. The radical is 土, whereas 鬼 is just a component. The radical is 酉, whereas 鬼 is just a component. Considering the definitions, I would say that the "devilishness" of 鬼 affects the meanings of 1832 and 1839, whereas its "ghostliness" feeds into 1280. Henshall agrees. In all three cases, 鬼 is the radical, so these examples prove that the meaning of the radical can affect the meaning of the whole character. By contrast, when 鬼 is just the component, that's not the case. A few issues arise here. First, if you don't know a kanji, you can't easily know whether a shape such as 鬼 is the radical or just a component. This distinction may not be crucial, because even components can lend meaning to the whole character. It's just that they're less likely to do so. Second, shapes don't always mean what they seem to, as we've seen with the radical 月. For example, Henshall mentions on page xix that although many dictionaries file 去 (258: to go away) under the "earth" radical, 土, the shape at the top of 去 has nothing to do with dirt. Rather, it derives from a component that meant "double lid." As Henshall comments, "Such listings can be misleading from an etymological point of view as they sometimes use graphic similarity as an expedient." Guessing the meaning of a character based on its radical is certainly not foolproof, and you may be the type who has no use for fallible methods. To meet the needs of people who do like to think about such matters, I've completed essays about all 26 of the junior high school kanji that can serve as radicals. Meanwhile, I would argue that it's extremely helpful (and endlessly fun!) to learn about all components, not just radicals. Without a firm handle on components, you could easily look at a character such as 盤 (1723: board, platter) and feel overwhelmed by its complexity. However, viewing the character as a collection of a few shapes (舟, 几, 又, and 皿) will help you think about it more calmly. By recognizing the components, you can also locate this kanji quickly in Denshi Jisho, because they're all listed there in the radicals chart. So is 殳, by the way; you could also view 盤 as consisting of just three components: 舟, 殳, and 皿. The crab kanji is the non-Joyo 蟹 (かに). Each of its four components can serve as a radical: 角 (the "horn" radical), 刀 (the "sword" radical), 牛 (the "cow" radical"), and 虫 (the "insect" radical). Here, 虫 is the on-duty radical. Speaking of Denshi Jisho, when you click on any component in its radicals chart, an array of kanji appears at the bottom. All those characters contain the component in question. Seeing the array gives you several opportunities. With 舟 (1354: small boat) as an example, you can survey the characters that include this shape. You can also scrutinize look-alike kanji, marvel at how 舟 changes its form and position inside characters, and investigate the ways in which 舟 lends its meaning to various kanji. If you select multiple components, you can produce a new array. You can see, for instance, how many kanji contain both 舟 and 殳. Three Joyo kanji do. In addition to 盤 (1723: board, platter), there's 般 (1714: general) and 搬 (1716: to carry). You may realize that these three kanji have on-yomi of バン, ハン, and ハン, respectively, providing a great example of an on-echo. (The link takes you to the glossary. From there, go to "Components, Radicals, Phonetics, and the On-Echo.") As the discoveries mount up, you'll get so excited that you won't know what to do with yourself! Given that my favorite topic in the world is kanji, I've often wanted to talk to native speakers about particular characters—in Japanese. However, I've found that it's not nearly enough to know vocabulary such as 部首 (ぶしゅ: radical) and 異体字 (いたいじ: variant). You need to know how native speakers actually string together sentences about components and radicals. The way to write 肺 is with 月偏 and 市. The way to write the "lung" kanji is with a left-hand "moon" or "flesh" radical and the shape meaning "city." In referring to the radical, Yamamoto could also say にくへん or にくづき; Tanaka would understand both as 肉偏. What Yamamoto is really saying with 月偏に市 is that you take the radical 月偏 and attach the component 市 to it. The に means "to" or "in." Here, Yamamoto makes it clear that he's referring to the 肺 featured in 肺癌. The 松 kanji has the left-side "tree" radical, 木, and katakana ha (ハ) and mu (ム). By the way, native speakers might clarify this by starting the sentence with 木の松は ... I figured they would instead say 松という木は ..., but a Japanese woman told me that with such phrasing, the first character could sound like 待つ (337: waiting), also pronounced as まつ. Returning to the discussion of katakana, I'm fascinated that native speakers say ハム as if it were one entity, rather than ハとム. I also find it remarkable that the listener would know the relative positions of ハ and ム. I suppose that's possible because several kanji contain 公, including 総 (738: all), 翁 (1037: venerable old man), and of course 公 (277: governmental). A Japanese native tells me that if a listener can't make sense of ハム, the speaker will mention おおやけ, the Joyo kun-yomi of 公, and that will clear things up immediately. It has the "movement" radical on the left, the "dirt" kanji stuck on a katakana no on the right, and a mouth on the bottom. I wanted to write the first word in kanji, but my sources disagreed about how to do this. According to one native speaker, people generally write しんにょう in hiragana, perhaps for the same reason I did. You write 裕 with 衣編 and 谷. Careful—the radical isn't the left-hand礻. You write the "abundance" kanji with a left-hand "clothing" radical and "valley." Be careful. The radical isn't the left-hand "showing" radical, 礻, but rather the "clothing" radical, 衤 (which looks quite similar). Very helpful—as long as students know all the shapes the teacher has mentioned! Does 待つ have the "going person" radical on the left, or is it the "person" radical on the left? It's the "going person" radical. With the "person" radical, it becomes 侍. Some explanations are in order. 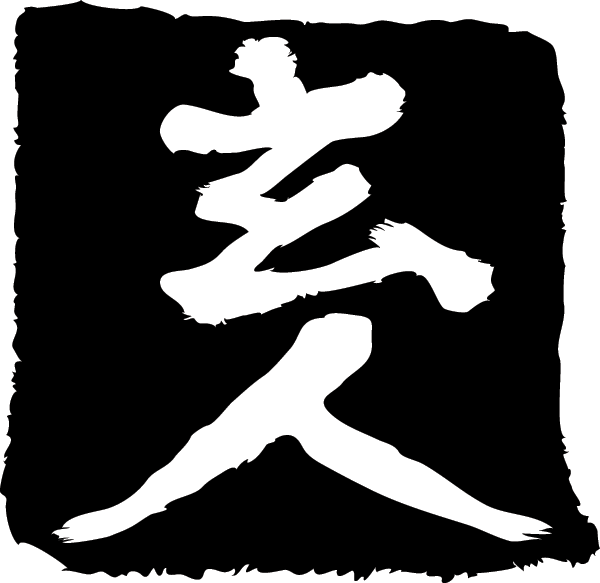 The kanji 行 (118: going) can serve as the "going" radical. As such, it has the yomi of ギョウ (which is an on-yomi of 行). The left side of 行, or 彳, is another radical. It always appears on the left side of characters, just as 亻does. As we've seen, 亻is called にんべん, meaning the "person" radical on the left. If you combine the ぎょう of 行 with the name にんべん, you get ぎょうにんべん. That's the name of 彳, also known as the "going person" radical. You can write ぎょうにんべん in kanji as 行人偏. This term appeared twice in the dialogue. Whew! So much to decode! With this version, one would read the second 待 as タイ; the sentence no longer includes 待つ (まつ). Try some of these sentences (or your own versions) on Japanese people to see if they know what you mean! Working with the ideas and vocabulary explained above, see if you can figure out which character each sentence is describing. Provide the shape and, if possible, the yomi and meaning. Click on a question to view the answer, then click on the answer to hide it. Sentence translation: It has the "hand" radical (扌) on the left and katakana mu (ム) on the right. Sentence translation: If you draw the left-side "water" radical (氵) and two "fires" (火) on top of each other, then it must be 淡. Sentence translation: If there are two trees, it becomes 林, "woods," and if there are three trees, it becomes 森, "forest." Sentence translation: It has the "animal" radical (犭) on the left, the "grass" radical (艹) on the upper right, and field (田) on the lower right. 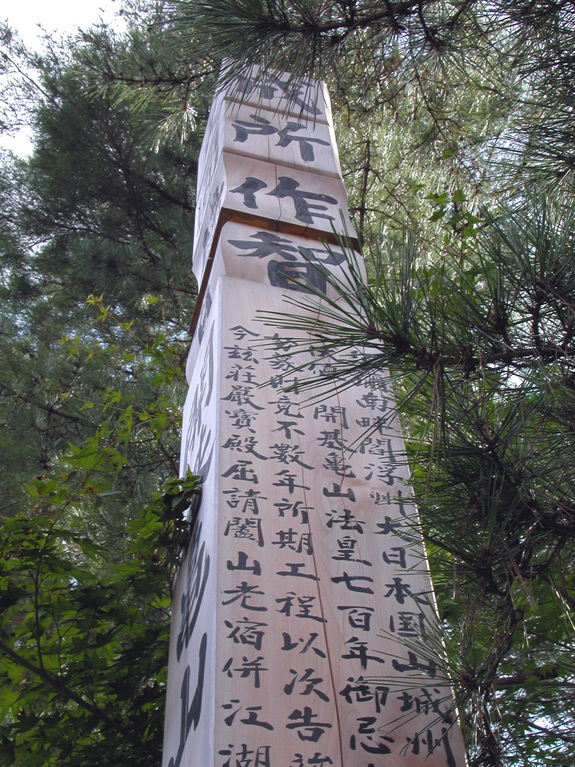 Sentence translation: It has bamboo (竹) on the top, moon (月) on the lower left, and power (力) on the lower right. Note that even though the 月 in 筋 clearly means "flesh," people communicate about it by using つき (moon). Sentence translation: It has moving rice. That is, it has the "movement" radical (辶) and rice (米). Sentence translation: What has thread (糸) on the left, a samurai (士) on the upper right, and a mouth (口) on the lower right? Sentence translation: What has a bird sitting in a tree? That is, what has the "old bird" radical (隹) on top of a tree (木)? Sentence translation: What has an arrow (矢) on the left and a bean (豆) on the right? Sentence translation: What has the "running" radical (走) on the left and a sword (刀) over a mouth (口) on the right? Sentence translation: What has the "word" radical (言) on the left and a sheep (羊) on the right? Sentence translation: What has white (白) on the top and water (水) on the bottom? Sentence translation: What combines the "person" radical (亻) on the left and a mountain (山)? Sentence translation: What has the "gate" radical (門) with a mouth (口) inside? Sentence translation: What has the "mountain" radical (山) on the left and up (上) and down (下) on the right? Sentence translation: What is a book (本) minus one (一)? For more on the functions of components and radicals in kanji, see the glossary. For more on the way radicals help us perceive characters clearly, see The Root of the Matter, a JOK Notebook post. For brief essays about particular radicals, see Radical Notes. Not finding what you’re looking for? Please check out the FAQ, or feel free to send us a question.